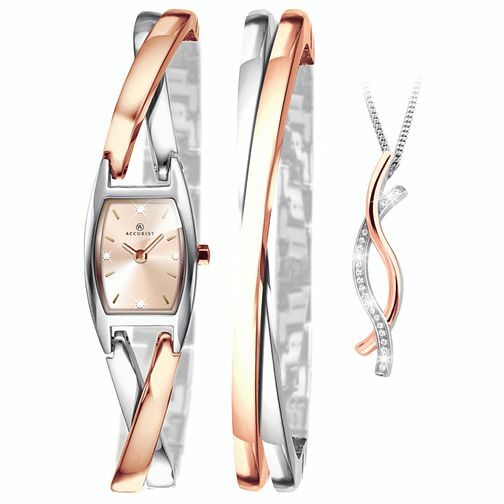 Stop them in their tracks with this delightful two-tone bracelet watch and necklace gift set by Accurist. A rose gold and silver toned bracelet features a twist on the traditional with its overlapping two-tone twist bangle design. A rose sunray dial steals the show, with co-ordinating hour markings and dials. This set is completed with a co-ordinating necklace. Adorned with glistening crystals, a rose gold and silver tone twists entertwine in similar style, on a silver pendant chain. A stunning set, beautifully crafted with a special someone in mind.